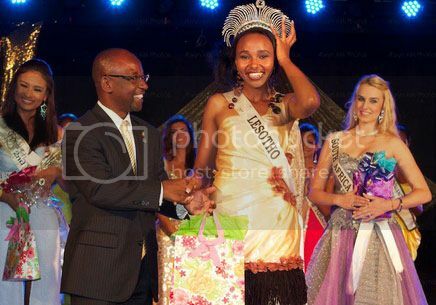 Miss Lesotho, Karabelo Mokoalla won the Miss Humanity International 2011 title during a beauty contest held last October 22 in Bridgetown, Barbados. The 1st run-up was Miss Dominica, Earlene Labassiere. And the 2nd run-up was Miss Philippines, Czarina Gatbonton. Completing the top 5 finalists were Miss South Africa, Natasha Pretorius and Miss Canada, Ashley Callingbull. It was the very 1st Miss Humanity International pageant, it is an international competition that focuses on humanitarian causes worldwide. 15 gorgeous candidates competed for the crown.